Stanbrook Abbey is a stunning wedding venue in Worcestershire. Stanbrook Abbey has acres of grounds, consisting of lawns and formally manicured gardens, all of which make for stunning wedding photo opportunities. One of the most beautiful aspects of Stanbrook Abbey however is the Callow Hall. The hall itself it vast, making up the central point of the Abbey, with a cathedral height ceiling and beautiful stained glass windows at both ends. The light that floods the room is golden and warm, thanks largely to the windows that are high in the walls. For this photo though, I chose to cut colour out of the image completely. I've always been a big fan of black and white, and I find myself producing more and more black and white images as my career progresses. Black and white adds a timeless quality, turning them into standalone pieces of art. Rebecca was at the end of the Callow Hall, just around the corner and out of view, waiting to make her grand entrance. 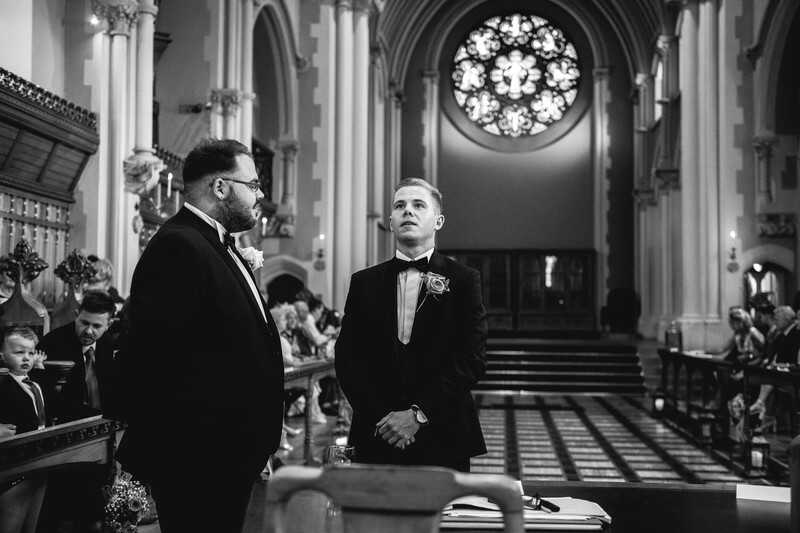 The anxiety of Ryan's face can clearly be seen as he awaits the entrance of the bride. What I love more about this image though is the look on the best man's face - a sly grin, letting the groom know that everything will be ok. The wedding itself was beautiful, and the day largely ran flawlessly. The bride and groom's dogs were the ring bearers for the day, and they were adorable. Everything was going fine until the registrar asked the father of the bride, who was now looking after the dogs, for the weddings rings as two bridesmaids were giving a reading. Upon reaching for the rings, he realised one of them was missing! I was kneeling next to the dogs as the bridesmaids were standing close to where I was originally positioned in order to see the wedding guests. 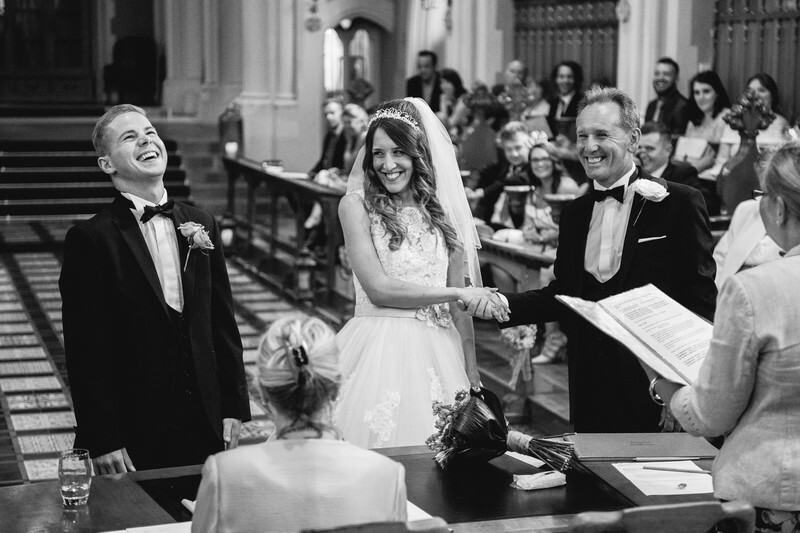 The father of the bride had a look of absolute shock on his face, for in a matter of seconds, he'd need to produce the rings for the registrar to be able to continue the ceremony. He whispered to me for help, and I had a look at the dogs myself to see if I could locate the missing ring. The ring was no where to be seen. As the father of the bride and I starting looking for the ring on the floor, we spotted that it was under the registrar's table - Whether the dog had dropped it whilst walking in, or it had fallen and rolled to that position we'll never know. I caught the attention of the registrar who managed to lean over and scoop the ring up. It was at this very moment that the registrar's colleague asked for the wedding rings. The dogs were walked up by the father of the bride, and the registrar knelt down to retrieve the wedding rings. She untied the first ring, and holding the second in her hand, pretended to remove the ring from the second dog! A genius move indeed, as no one was made any the wiser. No one actually found out about how close we came to disaster until the father of the groom's speech, where I was thanked for my efforts! If you'd like to see how these images helped tell the story of Rebecca and Ryan's wedding day, you can have a look at their wedding album design by clicking here.